The nature of marketing at a software company is that it’s easy to have a highly data-driven view of everything you do, and overlook hard to measure things like building a brand. This leads to a tunnel vision focus on optimizing funnels and growth hacking button colors, and ignores investing time in equally important tasks, like creating emotional connections with your customers. I’ve been lucky enough to work at two of the biggest brands in the world – Nike and Coca-Cola – who pour millions of dollars into brand building tactics like TV and outdoor advertising. If you looked at these numbers in a spreadsheet it might look like money poured down the sink, but what they both understand is that seeking emotional connections with customers cultivates more meaningful, sustained relationships over time. To help you do just that, I’ve put together a few principles I’ve learned about building a brand that will point any startup in the right direction. The words “brand” and “branding” get thrown around a lot these days. When people talk about a “brand,” they’re usually referring to something tangible, a design artifact like a logo or an advertising campaign. Brand is the emotional connection you establish with your customers and those whom you would like to become customers. Your brand is not your logo. Your brand is not an identity system. These items are all important identifiers of your brand, but they are not the brand itself. Your brand is actually much more than that. It’s how people “feel” when they visit your website or read one of your tweets or emails. It’s the emotional connection you establish with your customers and those whom you would like to become customers. Take the beverage industry as an example. When you think about Coca-Cola, what emotions and feelings come to mind? Comfort and happiness? For Sprite it’s probably intense refreshment. For Hennessy Cognac it may be luxury. For Red Bull it’s likely energy, focus and performance. Your brand is the set of expectations, memories, stories and relationships that accounts for a consumer’s decision to choose your product over another. It’s why people choose Coke over Pepsi, or Sprite over 7-Up. Even though your brand can seem like a weird, mystic force that surrounds your business, it can be controlled and managed. You can’t directly control people’s emotions, but you can control what your company looks like, what it feels like and the attitude that it projects to the world. Ultimately it’s these projections that will make your customers fall in love with you and keep them coming back for more. Values stand at the very core of your brand. They’re the foundation from which everything radiates – including your brand’s visual design, voice and relationships. Which means they’re pretty damn important. Flowing from their mission, they have a series of brand values that guide all their decisions. These are more tactical and speak to how they actually approach doing the work in certain areas of their business. 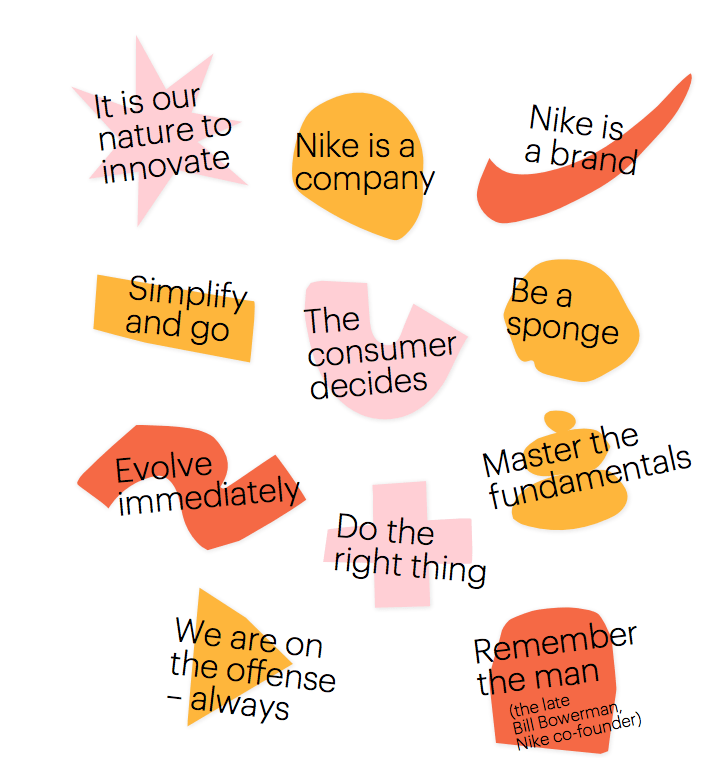 These values set the tone for everything Nike does, and the company consistently delivers on them throughout all their marketing and their products. It’s also worth noting that your brand values are a great opportunity to express who you are not as much as who you are. Being aware of what to avoid is equally as valuable as what to aim for, and will help people understand what sets you apart from your competitors. For instance, because Intercom is a brand whose values are all about cultivating meaningful relationships with customers, we make sure to explicitly say that we reject spammy, transactional communication, “growth hacking” and all the tactics that come with that. There’s a push and a pull to a set of thoughtfully written brand values and they should push away the wrong types of behaviors and tactics as well as pull the right ones toward you. To the customer, it should feel like the same person is talking to them the whole time. Selling or marketing your product and brand – on a call, at an event, on your site or on your blog. Helping people use your product – guiding them through the product itself, in a support conversation or in a help article. Your brand voice should be intimately tied to your brand values. For example, if you want to be a friendly and approachable company, as Intercom does, a tone of voice that sounds aggressive and aloof is going to turn potential customers off. If you are a large multinational like Oracle, adding gifs and emoji to your messages is probably going to leave people scratching their heads. It’s equally important that this voice is carried through every single touchpoint of your business, across brand, product and support channels. To the customer, it should feel like the same person is talking to them the whole time. However, it’s important that voice changes depending on the context. When a company’s voice and tone stay exactly the same all the time, its content comes across as insincere and automated. Think about it like a McDonald’s: You expect a Big Mac to taste the same no matter where you are in the world, but you also expect plenty of individuality tailored to each location (Halloween Choco-Pumpkin Fries, anyone?). These are the tangible elements that will determine how your brand is perceived visually, from your logo to your illustration, photography, image treatment, typography, color palette, etc. Your brand identity is what sets you apart from the endless sea of competitors and shows your customers what they can expect from working with you, so you’ll need to make some decisions on how some (or all) of these elements should look early on. Like your brand voice, your visual look and feel should reinforce your brand values. At Intercom, for example, we employ a friendly illustration style and softer color palette to explain our products and how they can help your business. We also use a serif font, which feels informative yet approachable. Contrast that with how the message might feel – colder, more aloof – if we used a sans serif font. It’s important that your brand’s visual identity is carried through the customer’s end-to-end journey. Even though different people or teams may work on these, your customer’s experience should be as seamless and consistent as possible. Consider the visual simplicity of Apple’s branding, which is aligned with the functional simplicity of their products. 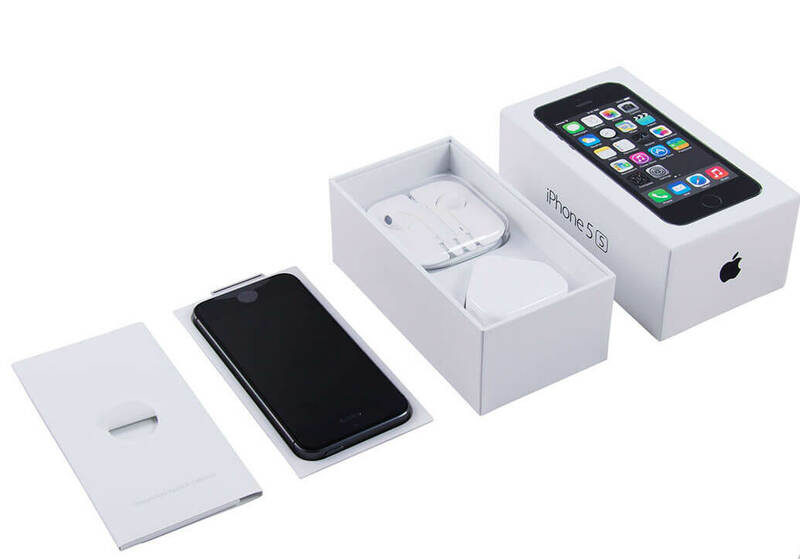 Their ads, their packaging and even the products themselves all feel quintessentially Apple. However, as with your brand voice, there’s a very real risk that consistency can become repetitive. It’s useful to think about your visual identity on a sliding scale that you can dial up or down depending on what you’re producing. At one end is the most conservative version of your identity. You might employ this when talking about your products or explaining your pricing structure. At the other end of the scale is a version that allows you to take much more risks. You might employ this when hosting an event, for example. Getting these three pillars right is not a simple thing. It involves people from across your startup – writers, marketers and designers, not to mention your leadership. But as we’ve written before, if you don’t tell potential customers who you are and what you stand for, well, they’ll just decide that for themselves. Now that you have a better understanding of branding, what have you done lately to shape that perception and be memorable?